On this page you can find information on some of the different Fusarium graminearum mutants I have made. 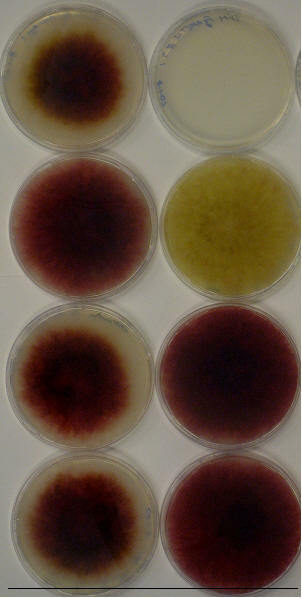 The information includes pictures, predicted function, reference to publication and the sequences of the Agrobacterium tumefaciens vectors used to generate the mutants. All deletion mutants are true deletion / replacement mutants, meaning that part of or the whole coding sequence of the targeted gene has been replaced by the positive selection marker hygromycin phosphotransferase (hph). 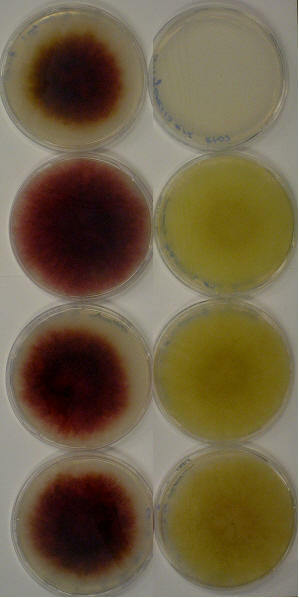 We have chosen to use the abbreviation "aur" to describe the genes in the aurofusarin gene cluster. Information on mutants that have not been published is not shown and is marked with "na". The pictures of the cultures is taken from the bottom of the dishes, and are captured after 7 days if not specified otherwise. 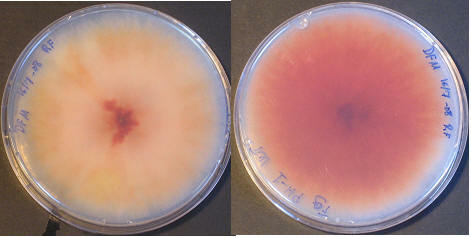 All cultures have been incubated at 25 °C in darkness, with the agar plates upside down. 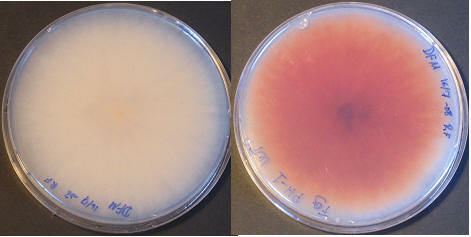 Domains "Binuclear zinc cluster domain" and "Fungal transcription factor domain"
Phenotype of mutant: The mutant is characterized by a milky white vegetative mycelium. The lack of aurofusarin biosynthesis is based on a lack of expression of the gene in the aurofusarin gene cluster. THIS IS NOT A DESIGNED DOUBLE REPLACEMENT MUTANAT - IT JUST HAPPENED: The PKS12 genes is rendered non-functional due to a mutation in its coding sequence, which occured during integration of the aurC replacement vector. Domains "O-methyltransferase, family 2" and "Winged helix DNA-binding" and "SAM (and some other nucleotide) binding motif"
The mutation is lethal but can be rescued by supplementing the growth medium with exogenous L-methionine. At low L-methionine concentrations the mutant is unable to complete aurofusarin biosynthesis and accumulates precursers of aurofusarin. At higher concentrations (the ability to complete aurofusarin biosynthesis is restored. 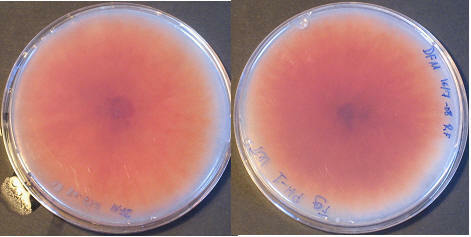 The mutation is lethal but can be rescued by suplementing the growth medium with exogenous L-methionine. The strain remains aurofusarin deficinet throughout the tested L-methionine concentration range.